Underneath the dark, star-speckled night sky, the usually quiet sounds of contently-sleeping SkyClan cats rang loudly in her ears as Pansyface tried to make herself comfortable in her new nest in the warm, milk-scent nursery. All day long she had felt uncomfortable and sore, her too-big belly weighting heavily beneath her as she had tried to go about her normal daily routine. The she-cat who was well known for despising feeling or looking downtrodden, now had no choice but to endure the unfortunate side effects that came with pregnancy. With a great heaving sigh and a frustrated grumble, the gray and white patched queen flipped over into a different sleeping position, her back arched against the edge of her mossy nest. The medicine cats had been telling her for days now that she was due to kit very soon, and at this point Pansyface was praying for the time to come soon; she wanted to feel comfortable again. As time had gone on she eventually moved into the nursery, to her great displeasure. Sure, the den was comfy and warm, totally free from any drafts or leaks, but to her it was a symbol. A symbol, of the stealing of her freedom. Being confined to camp was her worst nightmare; she lived to run free through her territory, exploring and hunting to her heart's content, but now, she was stuck in the most crowded, more uninteresting place in the whole forest! The feeling of horrible confinement she had felt as a kit, and as an apprentice when she got in trouble, was present now as well, and it ground at her nerves. Soon though, she would have a little family to call her own, to show the world to and nurture the same sense of adventurous excitement that she loved so much. Even in her deep discomfort, the thought of her children brought a pure smile to her face, as she sat up and licked her belly in a loving, motherly way, eyes half-closed. Oceanlight and Rabbitfoot had said that she was due to have a large litter, four kits or more apparently. She had lots of names floating in her mind already...she just wanted them to be here already! Well, it seemed her wish was soon granted. Pansyface let out a shocked, pained grunt as she felt her stomach contract, her already sore body wracked with even more cramps and aches. 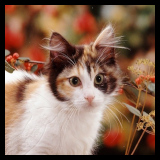 Heart beginning to race, the bi-color patched she-cat closed her eyes and groaned as yet another painful contraction ran like a wave through her body, and in a voice tense with pain, called out loudly; "I..I think the kits are coming! Oceanlight, Rabbitfoot!" She knew it was very late, and most cats were likely asleep, so she hoped that maybe one of the other few queens sleeping around her would awake to her call and fetch the medicine cats. Controlling her breathing, so far she was remaining very calm. She remembered watching her sister Cherrymist give birth in the barn; seeing how it would go helped greatly in keeping the first-time mother grounded and relaxed. It'll be over soon enough. Before Pansyface was giving birth, Oceanlight fell asleep, but soon was plagued by nightmares. It was dark, she could see nothing. She heard sad mewling of kits, like someone died. The mewing got louder and louder until she woke up to a call that someone was giving birth. "Oh StarClan... please don't be what I think it is..." she muttered. She ran all over the den, grabbing sticks and herbs she knew were for birth. She wasn't careful not to wake up Rabbitfoot. After she had all the herbs, she sped to the nursery to find Pansyface was giving birth. She instantly set some herbs and sticks in front of her, telling her to "eat this" or "chew that". She worryingly watched her. Rippedsky heard the queen's yowl and immediately ran to her side. After all of the time they had spent being close friends, there was no way he would let her go through the birth alone. He had been there for all of Cherrymist's labors too. It was only fitting he took the place of his late mate at her sister's side. Besides, the she-cat had no mate to call her own anymore; the warrior who fathered the soon-to-be-born kits had been lost not long ago. The deputy rushed over to the den and poked his head in. Blue eyes rested on Pansyface as she twisted slightly in agonizing pain. Per usual, he froze for a second before snapping back into reality. The black and white tom had fathered many kits and helped to lead a clan, but the miracle of birth was still not his area of expertise. Thankfully, Oceanlight also answered the call and was by their sides in a moment. A wave of relief washed over him as the medicine cat set to work. There was no way her could have ever walked in the other cat's paws and was grateful for his place as a clan warrior. Rippedsky shuffled his paws in the now crowded den and stood near Pansyface's head. He felt a strange rush of protection in his chest as he stared down at her. Thoughts of their life in Skyclan together seemed to rush through his head. She had been both a close friend to the deputy and a loyal warrior, he owed everything to her in this moment. Tenderly, his tongue ran over the fur just above her eyes in an attempt to soothe her. Even if as of late the current events had hardened him, there was still the soft and caring soul that had always been there. As he stood by her side, the tom meowed gently, "It will be okay, Pansyface... this will all be over soon." Screwing her murky green eyes shut tightly as yet another agonizing ripple of pain wracked her body, Pansyface was greatly relieved to hear the leaves around the den entrance rustle as someone poked their head in; fully prepared to see one of the medicine cats, she was a bit shocked to find Rippedsky's black-and-white patched face staring back at her. Quickly though a relieved smile replaced her cry of pain for just a moment, and she opened her mouth to ask him to fetch the medicine cats right before Oceanlight came bustling in, eliciting a great sigh of solace. She obeyed her every order, chocking down all the bitter herbs offered to her to try and somehow quell the extreme pain she was in, but the more it went on only the more intense it seemed to get. With every contraction she let out a loud cry, her closed eyes beginning to water as everything became harder and harder to bear. A comforting feeling though, managed to break through the wall of agony she was enduring. Opening her wide eyes, she looked up to see Rippedsky laying at her head in the place a mate would usually take, licking her head consolingly. Grateful beyond words, she could only smile up at him for a moment with a soft purr, before once again being pulled back into the struggle of labor. Even with her limited knowledge of this kind of situation, Pansyface could tell that this birth was lasting a lot longer than usual; much longer than her sister's had ever been at least. As she pushed on through the pain, the patched molly could only feel herself growing weaker and weaker, despite the measures taken by Oceanlight. She had known that this was going to be a large litter, but would't at least one kit have been out by now? The sun was just beginning to peek over the horizon when, finally, five tiny kits lay in the nest beside her. In this wonderful moment, Pansyface was totally unaware of the very large amount of blood that had been expelled during the birth, or that she was panting hard and lost for breath, and that her eyes were glazed in an unnatural, concerning way. With blurred vision, she only had eyes for her precious kits; four she-cats, and one little tom. Purring weakly, the exhausted she-cat leaned forward to nuzzle and begin to clean off her precious offspring, nosing each of them lovingly and tenderly; when a chill ran down her spine. Pulling back sharply, for a moment she stared blankly down at the ground, before whipping around to gaze at Oceanlight and Rippedsky in turn, trying her best to distinguish their forms against the rapidly blurring world. "No....no, NO!" Three of the kits were stillborn. A tiny squeal rang out from among the throng of newborn kits, as a little brown and white tabby she-cat tried her best to navigate this dark world, full of strange scents and sounds. Her only thoughts were of milk and warmth, and she could sense those were very, very near. Mewling pitifully, the tiny she-cat - her fur still slicked back and wet - began to crawl forward slowly, eventually finding comfort in her mother's warm fur. Latching on, she kneaded happily, blissfully unaware of the tragic consequences that bringing her into this world had created. For a moment, a very short moment, Oceanlight thought she averted a crisis, but she noticed the blood, the unnatural eyes, the abnormal breathing, and quickly realized she was wrong. She hurriedly ran back to the medicine den. She grabbed some raspberry leaves, then ran back and border-line shoved them near her mouth. "Please, chew on these." she insisted. Just looking at the medicine cat makes anyone know something is wrong. A tiny tabby kitten squeaked quietly, meekly crawling towards her mother. The scrap began to shiver violently, mewing in discomfort as she struggled to find anything that could keep her warm. She could barely feel something moving beside her and pushed herself against it, as if it could take her back to the dark and quiet she had known. All the black and white tom could do was attempt to comfort his friend as he watched the tremendous pain of birth ripple through her body. His tongue continued to rasp over her head and ears. It seemed to take forever. Even the tom, ignorant to the ways of birth, was able to notice how bad things were. Cherrymist's labors had not been this awful. A chill ran down his spine and a knot seemed to settle in his stomach. That only worsened as the kits were born. Three of them lay not moving, while the others buried in close to their mother. Rippedsky briefly left his position to move the cold bundles from the nursery. In case there was a sickness, he did not want the remaining ones to pass as well. Besides, there was no reason Pansyface should have to look upon the sight of her dead kits. He knew the pain all too well. "It'll be okay, Pansyface, stay with us..." Based on Oceanlight's reaction, he could only assume things were not looking good for the grey and white she-cat. His claws dug themselves into the ground as if bracing for something to happen. He could not lose her too. Addergaze, another dear friend, had lost her life not long before. Even if they had their differences, the deputy had regarded her highly and was still feeling the sting of her loss. Rippedsky was in no position to lose another life. Only his deep blue eyes showed the pain of his heart as he looked up at the medicine cat. His expression was neutral, but the tone of his meow gave away notes of desperation, "What can I do to help?" Oceanlight looked back at Rippedsky. "Just comfort her for now..." she simply answered. She turned back to Pansyface. She honestly didn't know what to do, but she wasn't going to admit it. In her frantic state of delirium, Pansyface barely noticed herself accept and chew on the raspberry leaves that were shoved into her gaping jaws; she only had attention for her tiny, forever still kittens, that were taken away from her side by one of her few remaining friends. Reaching out with a weak, shaking paw, the patched queen let out a strangled, choking cry as the blurry pelts of those unlucky three forever left her sight, but after a long moment of silence she blinked away the tears that clouded her eyes even more, and turned towards the two that remained. A beautiful duo of tiny brown tabby she-cats - one more white than brown - that both looked remarkable like their late father. Managing a shaky purr, Pansyface pulled them close with a bloodstained back paw, breathing in their sweet scent with watery eyes. The raspberry leaves had seemed to work a bit; the bleeding began to slow, and the she-cat's sense of clarity seemed to return close to normal...but she knew that it was too late. Her body felt as if it was toppling in on it's self, random twinges of pain and bouts of blurry vision plagued the queen as she struggled to breathe clearly. She could hear...something strange; but comforting. Fleeting whispers, seemingly floating on the gentle breeze, intermingled with her consciousness, calling to her with sweet sympathy in their meows. Some were soft and feminine...others low and laced with regret. One stuttered. "It...it's not use Rippedsky. Please Oceanlight, don't waste your precious herbs on me...it's time." Her voice, usually ringing with tones of light-hearted sarcasm, was now soft and breathy, leaving no time to waste on nonsense. With a weak smile, she turned to her kits. Her precious daughters. Oh, how could earlier this night she could've been complaining about the burden of carrying them? Every uncomfortable moment, every sleepless night, had been worth it to see their beautiful faces. Her gaze softer than it had ever been, she first touched her nose to the one with the more white on her pelt than brown; "Fernkit." Then the one that looked the most like their father; "Mintkit." With a light sigh, she closed her eyes and rested her head on the mossy floor next to them, speaking in soft tones that she knew they couldn't hear. "I'm so sorry my little petals...I'm sorry that I won't be here to watch you grow and thrive...I'm sorry that I have to leave you so soon...but please remember my precious daughters...all you have to do to find me...is look up at the night sky...find the star that seems to be looking down at you...and I will be there. I...will...love...you.....forever." Her voice growing weaker, the she-cat who could never seem to sit still barely managed to lift herself up a tiny bit to touch noses tenderly with her oldest and closest friend. Her glossy eyes still holding a bit of their old sparkle, she smiled weakly up at Rippedsky as she regretfully said a mournful goodbye. She knew this would be hard on him...so much death and despair had come his way in his life recently. First his mate - her sister - their close friend Addergaze, and now...her. "I...I'm s..so sorry m..my friend...p..please, do n...not despair f..for too l..long. We w..will see each other again s..someday, I promise you." Curling her tail around her beloved kits, she whispered so softly that even she could barely hear; "P..please.....take care of my d..daughters. R..raise them well...and don't b..be too strict w..with them. Let t..them make their o..own adventures...like w..we did." Finally, the weakening she-cat cast her sight rimmed by impending darkness towards the nursery entrance, catching sight of the rising sun illuminating the waking camp outside. Dawn was such a beautiful moment...the birth of a new day. One that she wouldn't be able to experience...but the first one that her kits would. She could only wish this could have been a happy time, filled with joyful laughter, surrounded by her friends and family. Her parents would be staring down at her proudly, while Vipertail congratulated her on a job well done. 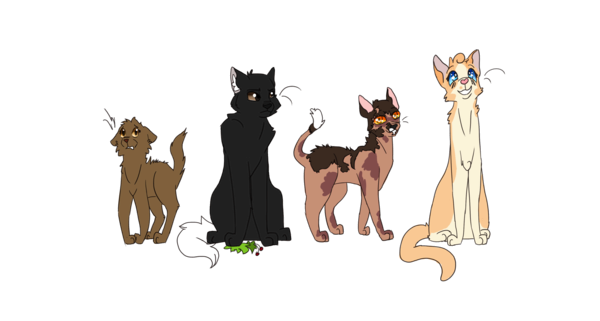 Rippedsky, Cherrmist, Addergaze, and Lilyheart would be looking at the kits with love in their eyes, while Thistleleap would be at her head, quiet but proud. Yet, there was still one missing, as it had always been. Dipping her head in a respectful manner, Pansyface summoned the last of her conviction into one single sentence, layered with emotions no one would ever be able to explain. "Farewell SkyClan...I'm glad I chose you." With a single flick of ears, Pansyface's murky green eyes closed for the last time, and her head dropped limply onto the mossy floor. OOC: I really didn't feel like crying today... You're such a beautiful writer! Mintkit shivered, her pitiful mewling drawing to a close as her mother drew her close. She buried her nose in her fur, breathing in a soft, wonderful scent. A strange, muffled sound met her closed ears, but even she could detect the emotion behind it. Something else, something loud and strong, rang through the kitten's body. Pansyface's dying heartbeat. She felt a warm breath of air on her face and instinctively lifted her small nose to meet her mother's. Something strange passed over the kitten that moment, and her eyelids fluttered as if struggling to open- to catch a glimpse of her mother. If her eyes did manage to open, she certainly wouldn't be able to remember it. She stayed close to Pansyface, her nose still buried in her patched fur as the warrior's body began to grow cold. All too soon Mintkit felt her source of warmth fade. The loud, rhythmic thumping that had echoed through the kit's body slowed and stopped. But there was still something there. Not nearly as big as her mother, yes, but something. Mintkit turned slowly and wrapped herself around her sister, still silent as she rested her small head on her sister's shoulders. Mintkit's world was dark, but her heart was opened wide, filled with light and warmth from her mother. There was so much she had to discover about the world. Her world. "No... no no. Pansyface. You can't give up on us. You can't give up on me..." His voice rasped and broke as he pressed his nose into her fur. The pain was evident in his words and the desperation only rose as his eyes darted to Oceanlight once more. His voice was muffled as he cried out again, only with a few more grabs at hope, not a trace of anger, "There has to be something more you can do. We can't give up." But, the medicine cat's face said it all. Pansyface was right. This was the end. For so long he had choked back the searing pain of loss from all of those that had left, but now a pain-filled yowl tore from his maw and was stifled by her bi-colored fur. Claws continuing to tear into the ground, he pressed his flank to her as if willing his own heat to keep her alive. There was no use. He quickly realized how incredibly hopeful it all was and the fire faded from his eyes, leaving them dull and distant. As she told him to watch her kits, the tom could only nod his head stiffly, knowing she would feel the motion. The black and white tom continued to bury his nose into her. Memories of her as a younger cat, cheerfully greeting him before they patrolled together, recovering after their battle against a Shadowclan warrior as apprentices, her yowling his name as he was named the deputy of Skyclan. Pansyface had always been there for him. Of course, he realized how much of a good friend she was, but he had never truly appreciated her as much as he should have. That thought tore him up inside and he meowed just loud enough for the she-cat to hear in her final moment, "I love you." As the light and breath faded from her body, his head hung low and his breath was heavy. For a few moments, Rippedsky didn't move. He was frozen, with no idea about what to think or feel. A tiny mew caused his gaze to drag slowly upwards. Her kits lay there, clinging to each other. They had no mother or father now. Like a few of his other kits, orphans in this world. There was a pang of sadness in his tender heart at the sight of the two. Stepping gingerly around Pansyface's still frame, trying not to think to much about it, he made his way towards the kits. The deputy gently nosed his way in between the two and their now late mother. His black and white pelt engulfed them, as he curled around them and settled his tail over his nose. For a few moments, it was almost as if his world had not just shattered. OOC: noooo, y did i picture this as a sad anime with the music playing in the background??? I was about to cry but a "Your free trial expired!" pop-up appeared and ruined the moment. IC: Oceanlight flattened her ears as Pansyface's life drained away. She was so focused on the scene before her that she didn't notice the light of dawn dappling on her pelt. She just stared at the lifeless Pansyface and Rippedsky and his kits. Fernkit purred slightly when she felt her sister press up against her, but the tiny she-cat didn't move from her position, buried deeply into her mother's belly fur, the lovely warmth and sweet milk-scent bringing the kit's senses to life. She heard many loud sounds begin to resound around her, and with a nervous mewl tried to nestle her way even deeper into Pansyface's short pelt. Suddenly, the scent of her mother grew even stronger than before, and Fernkit felt her warm breath caress her fur as she spoke. Her ears sealed tight, she couldn't make out distinct words, but the sound was there in a way. It was a quiet whisper, but seemed to echo deep love and remorse from within it's depths. Curious about what was happening, she tried to reach out a minuscule paw to touch her beloved protector's face, but it was already gone. Beginning a bout of scared mewling, she pawed at her mother's belly in alarm as the warmth began to slowly fade, until all that was left was a cold, stiff form. Terrified, the little she-kit let out a loud, sad cry, wondering where her mother had gone. Shivering, Fernkit accepted her sister's cuddle without hesitation, clinging to the little bit of warmth she had left. To her joy though, another body curled around the tiny two, this one with a much different scent but in the moment she didn't care. Purring as warmth once again nurtured her body, Fernkit rested her head comfortable on Mintkit's back, a slight purr resonating from her as she began to grow drowsy. The young she-cat had at one point been excited to meet her mentor's kittens when they came, so much so that Firpaw had secretly promised herself that she'd sit for them whenever Pansyface needed a break, or whenever she just needed to get away from them for a while. The deaf apprentice purposefully kept her nest right at the entrance of the den, so that when dawn came she'd naturally wake up, ready to aid the older warrior. When morning light shined upon her peach face, her rain-colored eyes shot open. At first the world was a bit bleary, but within a few blinks she was able to spot Oceanlight's tail coming out of the nursery. 'They kits are here? They're here!' A joyous smile graced her face as she fetched her mentor some wet moss - she would definitely need it. After retrieving what she assumed was a good amount, the unsuspecting apprentice trotted into the nursery, eyes glittering with happiness for Pansyface. At first she didn't notice the mourning faces of Rippedksy and Oceanlight, nor the fact that her dear mentor wasn't there with them anymore. However, it only took her a heartbeat for her paws to freeze and her body to stiffen. The moss fell from her mouth and onto the den floor, where the water was quickly absorbed into the dirt. Firpaw took slow, unsure steps towards her mentor's unbreathing, unmoving form. Eventually she made it until she was behind the body her mentor had left behind, forcing herself to block the view of the deceased warrior from any kit unlucky enough to be awake at this moment. Her gaze couldn't focus on any part of the grey and white she-cat, so instead she set those two grief-stricken eyes on the older cats, searching for some explanation as to what happened.